The Yukon Transportation Museum’s mission is to tell stories of Yukoners’ ingenuity and self-sufficiency through the history of transportation in the Yukon. Our mandate is to identify, acquire, preserve and conserve the history, cultural material and artifacts of Yukon’s transportation modes and to interpret this history in an educational manner for all Yukoners and visitors alike. You can support our mandate through an annual membership in the Yukon Transportation Museum Society. The success of the museum depends on the interest, generosity, and involvement of volunteers together with the encouragement and commitment of our professionally trained staff. As a member of the Society, you are invited and encouraged to participate in the direction of the museum through our Board of Directors, and you will be invited to participate in volunteer activities and many interesting projects. Become a member today. Download our membership form, or contact us directly. Your membership is valid for the current year. Memberships purchased after October will be considered memberships expiring the following year. 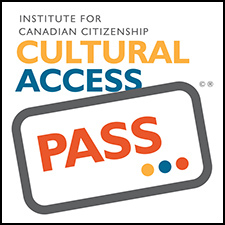 A gift to each Canadian citizen during their first year of citizenship, the Cultural Access Pass provides complimentary admission to more than 1000 of Canada’s cultural treasures from coast-to-coast-to-coast. The Cultural Access Pass creates opportunities for Canada’s newest citizens to discover our rich cultural history, world-renowned artworks, historical figures and stunning parks.